I am Dr.Prabha Singh, owner of Manuraj Ayurvedic Sansthan, Lucknow. 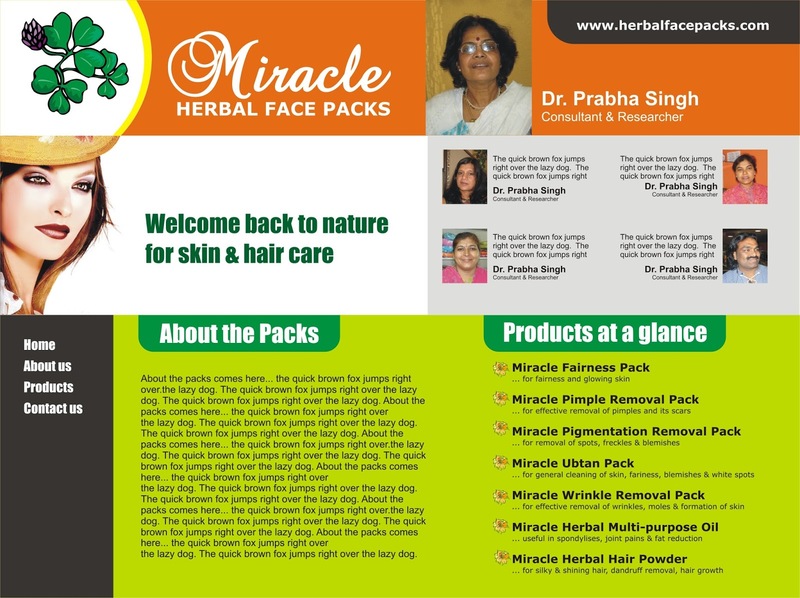 I have now shifted to Mumbai to spread my Miracle Herbal Face Packs to the people here and in the long run to everyone worldwide. A lot of my NRI and foreigner clients who visit my office in Citi Mall have expressed great interest towards herbal products in the countries where they live. Please feel free to contact me for your enquiries. It is my mission to remove scars and blemishes from everybody's skin. It is your birthright to look good. I know that like me, everyone has got fed up with tall claims of cosmetic companies to get rid of scars and blemishes but after repeated uses, you don't get to see any change in your skin. I have personally taken the task to spread this miracle to everybody, have distributed pamphlets personally in malls and shopping complexes and made clients who come repeated to buy these packs from me because they have seen the result. No tall claims. As written earlier, I have made these packs with natural ingredients and they do not contain any harmful chemicals. These packs are not cosmetics but are 100% made from herbal items. You are welcome to my office for a free trial of any of my product. I am sure like me, you are also fed up by the tall claims made by cosmetic companies but the final result is zero. All over the world, now there is a renewed interest in 100% natural / herbal products for the skin and India has always been a leader in providing herbal solutions for various skin and health problems. 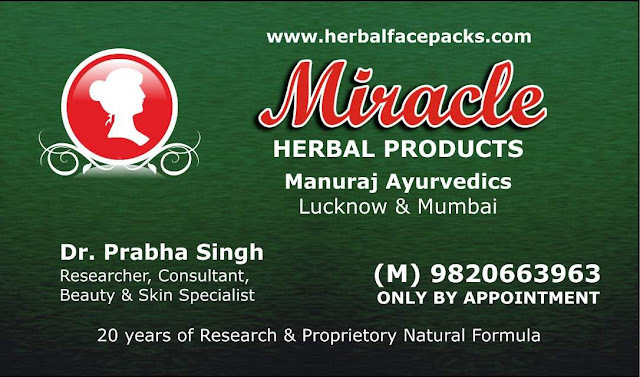 Miracle Herbal Products are the fruits of my 23 years of hard work and research, under the able guidance of my father, the famous Ayurvedic and Homoeopathic Doctor of Lucknow. All the Packs are made from 100% Herbal ingredients, do not contain any chemicals, they don't have any side-effects and most importantly, they are very easy to use. Just apply them as per instructions on the pack for the suggested duration and then clean your face to get the desired result. You can call me for getting a demo of all my packs either for retail or for wholesale. Rather than me speaking about my products, it is best that I let my clients say more about the same. All the testimonials are by genuine users of my products who can be contacted directly through their email or mobile number for verification of my claims. They would be happy to vouch for my products. Welcome to the home of Miracle Herbal Face Packs. 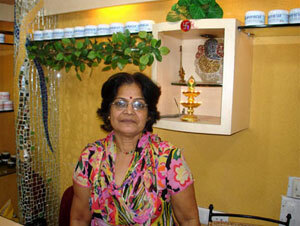 I am Dr.Prabha Singh, Herbal Consultant and Researcher and Miracle is the result of my research of the last 23 years. Miracle was born out of a personal problem that I went through. When I was young, my fiance broke the engagement because I had a lot of pimples and blemishes on my face. Now I had two options, first was to keep crying on my fate and wait for the next proposal and the second was to do something about the same. I am daughter of an Ayurvedic and Homoeopathic Doctor from Lucknow and I already knew some basic combination for keeping the skin healthy. After this unfortunate happening, I joined a famous herbal beautician to learn more about the skin and within 1 month, I myself prepared a solution for the skin and started treating my own pimples and blemishes. Within 2 months, there was visible difference in my skin and within another 4 months, I had a soft and beautiful skin without any marks or scars. That is when my old fiance noticed me and we were re-engaged. My own success inspired me to devote my life to this cause and now it is my mission to remove pimples, scars and blemishes for others. I have not stopped my research and I still continue making combination for various skin diseases. Please feel free to call me or write to me with your skin problems and I would be glad to help you solve the same.